All active PSOC members get free gear rental from Adv. Rec. So far this year, PSOC members have rented over $3200 worth of gear! This is awesome! Tons more people are getting outside. Our officers sat down with Adventure Recreation 2 weeks ago to negotiate a new deal. Up for re-negotiation next year, based on membership, etc. 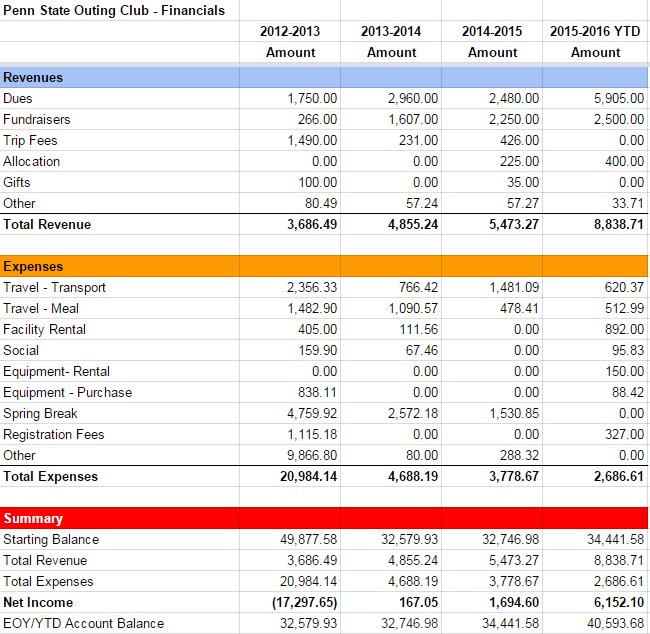 Based on the success of the gear deal this year, the great relationship with Penn State Adventure Rec, and the club’s current financial standing, it is the recommendation of the officers to approve this gear deal for next year. In order to help your decision, here is a summary of the financials of this year to date, and the previous 3 years. Notice that we currently have approximately $6100 left in the budget for this year (“Net Income”). Any questions, feel free to ask the officers at psoc-officers@googlegroups.com.